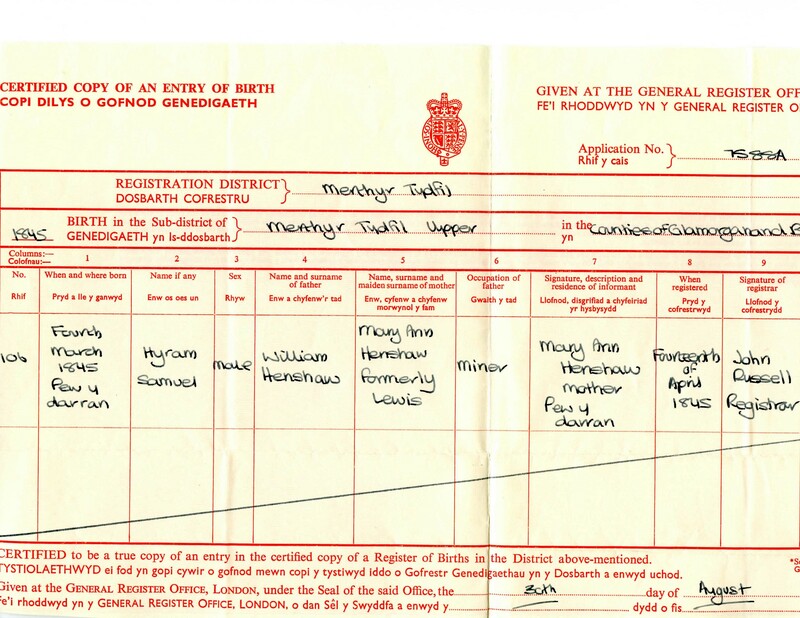 Register of Births in Merthyr Tydfil "Hyram Samuel Henshaw (1845)," no. 106 Merthyr Tydfil Upper, Merthyr Tydfil, Glamorgan, Wales. Family Tree (www.familysearch.org: accessed 7 April 2016), Hiram Henshaw entry, PID: L2Q6-Z7L. Find A Grave (www.findagrave.com: accessed 16 April 2016), memorial 117335557 "Hiram S. Henshaw (1846-1910)," Edwardsville, Madison, Illinois. Left Liverpool, Lancashire, England on 04 March 1851 aboard the ship Olympus. Arrived in New Orleans, Orleans, Louisiana, United States on 27 April 1851. Mormon Migration (www.mormonmigration.lib.byu.edu: accessed 7 April 2016), Hyrum Henshaw entry, age 6, arrived 27 April 1851 on the Olympus.